As Joe Mauer's average continues to creep back near the Mauer Line (.300 ... he's at .297 after today), we pause to note that he is now 9-for-16 as a hitter while playing first base. That's a .563 batting average (and a .563 slugging percentage, as all the hits have been singles). Even with that extremely small sample size, that type of output -- again, without the power but still impressive -- won't quiet the "Mauer shouldn't be catching" folks any time soon. It was particularly interesting to see Mauer start three of four games against Cleveland (all of them in the sweltering heat and humidity) at first base. 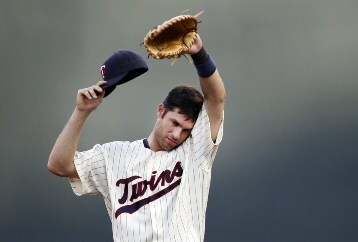 It was also convenient that he could slide behind the plate late last night after Trevor Plouffe pinch hit for Drew Butera (if Mauer was the DH, of course, he could have done the same but the Twins would have forfeited their DH the rest of the game). Plouffe went to RF, Michael Cuddyer went to first base, making for a pinch hitting situation that didn't require an additional bench player going in for defense. All of which is a long way of saying: Mauer's top value is clearly still as a catcher. But this part-time first base experiment is working out about as well as anyone could have imagined. Thursday (Ranking Twins players in big situations) edition: Wha' Happened?